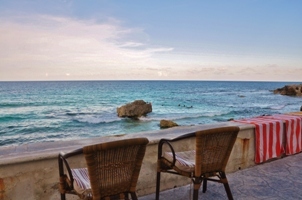 In Spanish, “Sonrisa” is defined as “big or broad smile”, a common reaction when you walk into the spacious casita and see the views of the turquoise Caribbean Sea. Imagine waking up and watching the sunrise without leaving the comfort of your king-size bed. 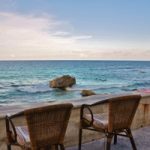 The sliding glass door opens onto a furnished terrace that overlooks the ocean and has private access onto the ocean walkway for early morning jogs or walks to beautiful Playa Norte and the downtown area. The terrace has a hammock for relaxation and enjoying the morning sunrises or afternoon shade. The kitchenette has everything you will need to prepare your favorite drinks, light meals and snacks. In the dining area, there is a Mayan styled kitchen table and chairs, as well as a daybed couch that can be used as a bed for two small children or an extra adult. An oversized closet has lots of room for storage and extra linens. The colorful 3 piece bathroom has a walk-in shower, talavera sink and hand painted tiling throughout. Prepare to relax, pour yourself a drink from the full sized refrigerator, climb into the hammock and put on your big sonrisa! Rates are based on double occupancy. Please add $20 per night for each extra person. If notice of cancellation is received 60 days or more prior to your arrival, your deposit, less 20% for handling charges, will be refunded. If notice of cancellation is received 30 days before your arrival, 50% of your deposit, less 20% for handling charges, will be refunded. If notice of cancellation is within the 30 days prior to your arrival, there is no refund of your deposit, however there is no charge for changing your dates within the next calendar year, if available. Old City, Philadelphia, PA 19106.